(AFP) - Iran has notified the International Atomic Energy Agency that it has launched a plan to increase its uranium enrichment capacity, nuclear chief Ali Akbar Salehi said Tuesday. "If conditions allow, maybe tomorrow night at Natanz, we can announce the opening of the centre for production of new centrifuges" for uranium enrichment, said Salehi, a vice president and head of the Iranian Atomic Energy Organisation, according to conservative news agency Fars. "What we are doing does not violate the (2015 nuclear) agreement," he said, adding that a letter was submitted to the IAEA "yesterday regarding the start of certain activities". He specified that this was just the start of the production process and "does not mean that we will start assembling the centrifuges". 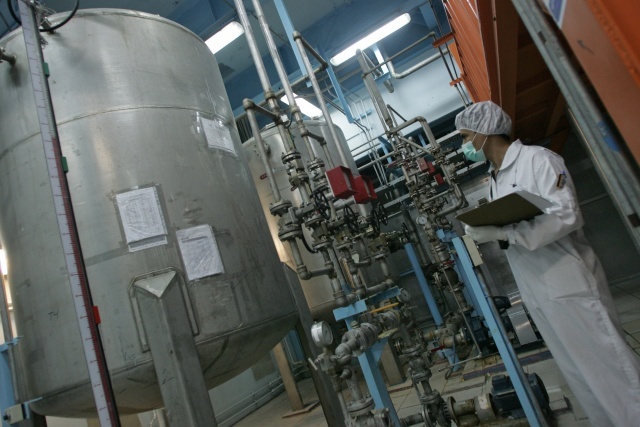 Under the 2015 agreement, Iran can build parts for the centrifuges as long as it does not put them into operation within the first decade. Salehi also emphasised that these moves "do not mean the negotiations (with Europe) have failed." European governments have been trying to salvage the agreement ever since the United States announced its withdrawal last month and said it would reimpose sanctions on foreign companies working in the Islamic republic by November. The other parties -- Britain, France, Germany, China and Russia -- have vowed to stay in the accord but many of their companies have already started to wind down Iranian operations. On Monday, Iran's supreme leader Ayatollah Ali Khamenei warned the Europeans that "Iran will never tolerate both suffering from sanctions and nuclear restrictions" and called for preparations to speed up uranium enrichment. Iran insists its nuclear programme is for civilian uses only, but opponents in the US, Israel and Saudi Arabia accuse it of seeking to build an atomic bomb.